It is day 1237 and the UK-9 server has just started the 5th age. The 4th age ended on Day 1204, and during the last 34 days House 10 has generated 3,037,709 glory which is a rate of 89,344 per day. At this rate the current Glory round will end in 11 days on 31 August 2017. The way too soon estimate on the end of the 5th age is 537 days from now which is in 2019. 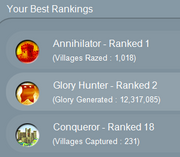 457 players have 5+ Villages (that is 35% of the server) which is my usual metric for active/important players. 29 players have the maximum 40 villages and another 43 players have between 30-39 villages. 72 players with 30+ villages is 5.5% of the server. It is day 1273 on the UK-9 server and we are in the second Glory round of the 5th age. The first glory round to 46 days and this glory round is on pace to take even longer. House 10 has 1,986,931 Glory which is a rate of 82,789 per day. At this rate it will take another 556 days to complete the 5th age, which projects to April of 2019. There are 1,408 players on the server. 689 of these players have a single village, which is about half of the server. And like other late age servers many of these players are occupying a House slot. It is day 1,308 and the UK-9 server is in the 5th age. The last glory round took 45 days to complete. House 10 has 1,478,561 glory after 12 days which is a rate of 123,213 per day. It is day 1,426 and World 9 is also in the 5th age. House 10 is well in the lead with 6 stars and the lead in the current round. House 10 has 853,683 glory after 7 days which is 121,954 per day, a superior daily rate. 5 more glory rounds and this server moves to the 6th AGE. There are 1,355 players on this server. It is day 1507 on the UK-9 server. We are still in the 5th age. HOuse 10 has 8 stars and there are 4 houses left in the glory race. There are only 1,402 players on the server. 624 of these players (45%) only have 1 village.